January saw the Regiment in action in at the Battle of Trenton on the 2nd. A rare appearance for us in this busy time of the year. This was a fun event where we all got to know our new recruit Sean Murphy and lay some groundwork for an event we will be hosting later this year. As per tradition we finished the battle in the Yankee Doodle Tap Room in Princeton where we hooked up with Regimental Beer Expert, Eric Alsager. The 15th was the British Brigade Officers meeting. The CO, Adj. and senior NCO attended to hobnob with the shiny types and share a pint or two with the Sergeant Major. We also got some scheduling work done as well. We had our Regimental Dinner on the 22nd at the Old 76 House in Tappan, NY. The wives and sweethearts made a beautiful appearance as pointed out by Private Robert Wnukowski during the toasts. More and more lads are turning out in Association blazers and ties and make a neat appearance. We are all members of the Trenmere branch of the Cheshire Regiment Association and we are proud to wear our ties and blazer badges to show our strong ties with the Regiment back in England. February 17th was Meeanee Day and those of us who could get out on a Thursday night celebrated this Regimental day together. A “thank-you” is simply not enough for the Tranmere Branch (our Branch!) of the Cheshire Regiment Association, for their kindness in providing the “American Contingent” with a hand-embroidered Regimental Colour. After 20+ years of service our old Colour had reached the point where any more use would have resulted in unrepairable damage. It last saw service at the Portsmouth Historical Society near the site of the hardest action the 22nd Foot/Cheshire Regiment encountered during the Battle of Rhode Island, resulting in the loss of 14 of our men. We were able to place a marker of the men’s names and a Cheshire wreath provided by the Tranmere Branch at the site, which is now in the Collection of the Society. Our old Colour was carried back to England by Sgt. Brian Payne, used as the model for the new and will take up residence in the Museum at the Castle in Chester. The new Colour was officially presented to the men of the Regiment on 12, March and will take the field with us at Connecticut Farms 4, 5 June. 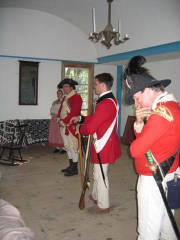 Thanks to all those who came out to our Garrison weekend at Washington Crossing’s (12-13 March). We have been doing things there for at least three years (if memory serves me correctly), BUT I must say I think this was one of the best times ever! And I didn’t even make any three years olds cry! Thanks also goes out to our opponents the 2nd NJ, Helm’s Co., who the majority of us initially thought were park interpreters/volunteers… that is until things started disappearing. I was sworn to secrecy by our Adjutant (who deserves all the credit! ), so it was fun seeing some of us catch on quickly, while other’s thought the “Helm’s-men” were just there to conduct tours – standing their posts and merrily letting them go in and out of the buildings. A few missing muskets, coats and the payboxes later, we all realized our mistakes…. By Sunday we had lost a few of our own and a few of the “Helmsmen”, but the “fun” continued on a more “overt yet crafty” level until mid-afternoon. By then the big tour-groups started (It being Charter Day) and it was all we could do to write out our Loyalty Oaths, keep the cookhouse open and running, conduct group or unit firing demos, etc. I’m sure there will be a more-detailed report at some point, so I will end here mentioning the sterling services of Eric Alsager, who at the last minute provided a tremendous dinner for us back at the Billet, Liz, Rose, Sue (4th Batt’l NJV) and Mark, who kept the cookhouse fires going and the public entertained. Back in quarters Colonel Punch-Meister Braisted should be commended, Dance Master Torkos, the Duke of York (who made an impromptu visit to sing “Christmas in the Cookhouse”), and Martha Stewart who came all this way to Dance with “JT the Crazy Magyar”. just as great on Sunday for lunch! and lunch need be mentioned. will send that out to all. troops! He even wore an Cheshire Officer's Uniform! make sure that gets in the next OAKLEAF. Good save the 22nd Regiment & Captain Vilardi! Private Torkos makes himself usefull during the Regimental Dinner. be plenty of opportunities to get together. a member of the best fraternal organization out there. Three HUZZAHs for the 22nd! Nate, John and Andy relaxing before the Dinner. Stopping players who had bogus documentation or who were trying to get pastthe sentinels throughout both days 500 points to the Crown. Some documentation was quite entertaining. Stealing the camp colours a couple of times earns Helm's Coy 500 points. I would have given 1000 points there but I sort of forgot to tell the guard that we were engaged in a tactical so that was kind of easy. Stealing the off duty men's muskets 1000 points, stealing them from theguard room 1000 points, stealing them while former Lance Corporal Torkos had the guard...1000 points to Helm's Company. Stealing the regimental pay chest, 2000 points, stealing the pay chest fromthe officer's day room 1000 points, stealing the regimental pay chest while former Lance Corporal Torkos had the guard...1000 points to Helm's Company. I'm not going to issue too many points for Sunday because of the hangoverfactor but one incident stands out. Mugging former Private Sentinel Corwin, and relieving him of his musket and regimental, 1000 points to Helm's Company. Catching the man who mugged Corwin with the regimental on under his jacket, Recruit Murphy earns 500 points for the Crown. For stealing a prisoner's haversack, canteen, gloves and watch, Serjeant Krentler earns the Crown 500 points. For hiding under a log in the river mud, Everett earns Helm's Company 100 points. Hope he had his shots. For knowing the correct place to hide and be found 50 points to Paul Hutchins for Helm's Company. For having the balls to do a French painter's impression in a Brit camp, 5000 points to Paul Hutchins of Helm's Company. For saving a confused recruit from possible serious injury or death at great personal risk, Fifer Licheck and Drummer Roberts earn Crown forces 500 points each. (Actually, not during the tactical, but pretty funny). For personal bravery above and beyond the call of duty, in the face of apple pie at body temperature, reinstated Lance Corporal Torkos earns the Crown Forces 1000000 points. (Also not during the tactical but also too funny). Wait, some last minute points. For knowing that it is sometimes difficult to be a true friend, 50 points to Neville Longbottom! Griffindor wins the House Cup! What else can I say about the weekend? I enjoyed the addition of the civilian impressions as far as being laborers. 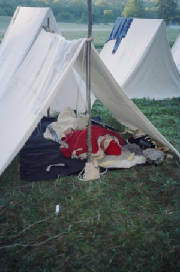 I don't know if they had a chance to interact much with the public but that is another interesting aspect of military life that does not get addressed much at reenactments. I'm sure they enjoyed the Pay Call as much as the troops did. And I think Robbie has said all that needs to be said about the presentation of our new Regimental Colours. I too am so proud of our close ties to the Regiment we portray. I'm still full from dinner! We covered the food, but let us not forget Steve Krentler lugging his favorite beverage in the economy size package out to us. I know I had my fair share. Todd Braisted is Punch Master General! I'm never disappointed with his creations. Also, thanks Todd to you and the rest of the NJV falling out with us again and for filling the gaps on Sunday. I think it worked out that we had the same amount of men for both days though that still was not enough against determined resistance. Finally, thanks to everyone who helped clean up and pack up. We were all pretty tired but the job got done. See you all at Bound Brook and Liberty Hall! I think this was a very successful weekend. 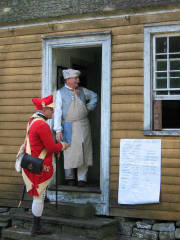 Not only did we put together an accurate depiction of events around Liberty Hall in June of 1779, we also enjoyed a great weekend of camaraderie seeing some friends we haven’t seen in a long time. Earlier in the week Tom was busy working with the site to make sure al the amenities were in place, (this is the first event of it’s kind for the site and the event coordinator). By Thursday Tom was laying out both camps by himself and I met him with the unit canvas in the evening. We got four tents set up and made plans for the rest on Friday. Tom, Rob, W., Andy W. and I met on Friday and, after fortifying ourselves, set up the rest of the tents and the dining fly in the rain. Just as we finished setting up, our first long missed comrade arrived, none other than Don Hagist. Captain Vilardy with the Music and Col. Hagist out front. Comrades making the best of a shade tree at Liberty Hall. By the time I got to the site on Saturday I had just enough time to get my kit together and fall in. It is here that I saw some more missed friends. The Duncan Brothers, Paul and Lee, Dave Mutter, Gary Vorwald, and Clark Deihl. All in all we fielded 14 officers, men and music during the weekend. Sergeant Krentler hadn’t made it yet so I was the NCO under Don. If I remember correctly we had a good showing on the Crown side with our unit, Eric Schnitzer’s new 62nd lights, 53rd lights, 42nd Highlanders, our own Light Coy. the 64th under Mike Grenier, Von Donop and our steadfast friends in the 4th Bat. NJV under Todd Braisted. We marched to the Livingston manor and found the Governor gone but his brave daughters remained and they used their charms to convinced Colonel Mallet to spare their home. 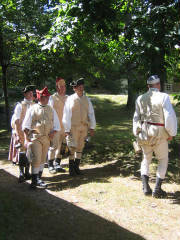 We then marched around the grounds of the site and "surprised" some local militia in their encampment. We quickly deployed from column in close order to line in open order and advanced either in line or by single file parallel to the front until we had pushed them off the field. 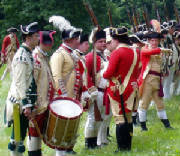 It turns out that not only were there New Jersey Militia such as Herd’s Brigade, but there were our old friends in the 2nd NJ Helm’s Coy. Of the Continental line facing us as well. After the battle we posted some guards and I had to leave to take care of some important personal business. While I was gone there was a formation to celebrate the King’s birthday where members of the unit were awarded Medals of Merit for years of service in the unit starting with seven. I believe that right after this formation the Rebels probed the camp and were successfully beaten back. Too bad for the Rebels that Sergeant Krentler was back with the Coy. There were also many vignettes going on where spies infiltrated the camp and local men were hired to work on field fortifications. The Rebels attacked again, this time moving through the woods on either side of the field. Sergeant Krentler took us into the woods after them, (of course) and we literally pushed them into the field where we re-deployed and fought them to a stand off. That was it for the fighting on Saturday but the fun was just starting. Back at the Manor there was an 18th C. concert and English Country Dancing as well as a Tea. Liz and Rose worked long and hard on dinner and what a feast! The first thing everyone will remember from supper is onion pie! Then there was chicken and dumplings, coleslaw, bread, cheese and etc. Dessert had two pies and a special cake that my wife Wanda baked for my, (and the King’s), birthday, decorated with the Union Flag. The Tavern at Liberty Hall. Sunday’s first formation wasn’t until 11:00 am giving us time to rest up from the last nights fun and have a leisurely breakfast. Liz and Rose did another great job. As we fell in and moved to the flag ceremony we got an idea about the challenge for the day as the temperatures moved rapidly towards the 90’s. After the flag ceremony we built a small depot for the Rebels to attack and waited for them to surprise and overwhelm our light infantry patrol. Once the ball started we formed up under Colonel Braisted and went into action. The light infantry reformed and chased the rebels back into their camp. We traded some volleys then the Rebels counterattacked with a bayonet charge. We pushed them back again but suffered several casualties in one particularly effective volley. We retired but Colonel Braisted assured the Rebels that we would return. We then had some more down time in which we just attempted to cool down. Finally we formed up for the march out and went to the manor and retrieved the Colours. On the way back the Rebels hit us again and we withdrew fighting a rear guard action until we reached the Brown House. During the action Tom carried our new Regimental Colours for the first time in battle. The final act had the 62nd lights ransacking the Brown House as we left complete with shrieking girls that Tom had recruited earlier in the day. Tom must like the 62nd to let them have all the fun. Breakdown was a little tedious given the heat but we all got it done and Tom, Rob and I left the site around 6:00 pm. Sergeant Krentler and I arrived at the site around dusk after an uneventful drive slightly delayed by holiday traffic. We had a light supper, spoke briefly with some of the other early arrivals and retired early hoping that we would not be the only members of the unit on hand when morning arrived. It was a clear cool night and dark enough to see the Milky Way. Saturday morning had us up before the sun had cleared the trees. We made breakfast on my brazier. Hot coffee got the blood flowing. After the sun reached our camp, we started to kit up, watching all the cars that were arriving and hoping to see some of our lads. To make a long story short, all the men who committed arrived in the next few minutes. We had Krentler, Torkos, Lustenburger, Mutter and I. Believe it or not this was not a proportionately small number. 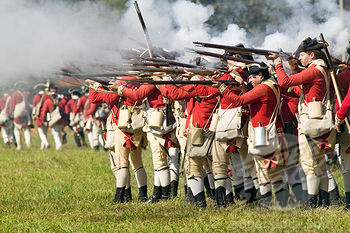 The other Crown units were the 40th foot with around six muskets and a combined Loyalist unit, mostly Peters Corps, with a total of six or seven muskets. We were under the command of Captain Najacki. The Rebels had similar numbers so the sides were evenly matched. We loaded two extra blankets and an axe on the baggage wagon, the rest of what we needed for the weekend we had on our backs. Next, we formed up and were issued hard rations for lunch. After this the Rebels and the women headed one way and we went the other. I have no clue what the objective of the tactical was supposed to be so I guess I was as much in the dark of the big picture as my 18C counterpart. We were given the order to load on the march and headed down an overgrown farm track. The old road was overgrown with the weeds coming to our chests in places. The growth on either side was so tangled and thick that it would be impossible to move off the track except on a rare game trail. There wasn’t much visibility and no way to put out flankers. We moved cautiously along in single file with about 30 yards between units. The Loyalists were in the front, followed by the 40th and then the 22nd. As usual it seemed as if much of the hiking was up hill. We eventually came to clearer ground with more mature trees and mostly clear beneath. There were several stone rows which we crossed until we came to a more well used road. Still no sign of the Rebels but the advance guard captured a man on a horse who claimed to be a loyal citizen who was forced to flee his village by a detachment of Rebels. Captain Najecki was a little suspicious of this gentleman, however he could not ignore the information on the location of the Rebels. We moved out with the horseman under guard and imagine how nervous we were when the direction he led us took us right across a huge open field. We crossed the field in rushes without incident and gained a little more confidence in our new source of information. We continued down a clear road to an intersection where we found the 40th who had the Rebels in sight. The Loyalists and 40th moved forward across a small field that sloped steeply away from us. We followed close behind. The Rebels fired a volley or two and fell back. We fell in between the Loyalists on our left and the 40th foot on our right. We hadn’t fired. In front of us was a two-story farmhouse built into the hill that we were on. To our right was a large shed. Between the house and us was a steep wooded drop of about 15 feet. We were quickly ordered forward with the Loyalists going to the left of the house the 40th going to the right of the shed and us going straight down the embankment to the rear and right of the house. I used the back wall of the house to stop my momentum after going down the embankment. Torkos twisted his ankle here and lost sight of us as we rushed the Rebels who were on the main Albany – Boston road. The road was now to our front. On the other side of the road were two large barns, side by side. To the left of the largest and left-most barn the road turned at a right angle and the Rebels were falling back around this corner and using the barn and a stone supported earthen ramp to the barn as cover. The Loyalists came around the farmhouse and started to flank the Rebels on the left. The Rebels fired a volley at the 40th and us. Then we rushed them. Sergeant Krentler was going to cut the corner by running across the dirt ramp instead of following the road around the corner. There was a possibility of flanking the remaining Rebels or even cutting them off. Unfortunately, he underestimated the drop from the ramp to the level of the road because of the weeds along the stone wall supporting the ramp and dropped 6 to 8 feet instead of the 3 to 4 he was expecting. This earned him a bruised heel for the rest of the weekend but at least nothing was broken or torn. Steve yelled to me that he was all right so I took the men around the bend and continued to push the Rebels to the next stone row. Steve was quickly back with us and so was Torkos. On our left was a large pond that slowed the Loyalists down and put them behind us. We all kept pushing the Rebels and didn’t give them a chance to form at the Stone row. It was about 50 to 75 yards from the barns to this stone row. We still haven’t fired. The 40th moved to left now and used a thin wood that ran parallel to the road as cover. We started pushing again up the road and the Loyalists now moved to our right. Ahead another 50 to 75 yards was the entrance to the village flanked by a large stone wall to our right and some sheds and a wood to our left. The road at this point was sort of sunken with a stone wall and fence on either side as it rose up into the village. The Rebels had loaded on the run and formed on the road at the entrance to the village and below the stone wall on our right to give us fire. This slowed us down as we were in the open and used the ground for cover when they fired. The loyalists caught up and moved against the men on the right while the 40th was moving on the left rear through the woods. We charged as the Rebels moved back, bypassing those on our right. The Rebels counter charged and there was a stalemate in the sunken lane. The action sputtered to a halt with a lot of claims back and forth about who was the victor. I’m pretty sure my pack was the victor of the last 50 yards between the last stone row and the sunken lane. We formed up and paraded together with the Rebels and were informed that there had been a cessation of hostilities and that we now were going to work together to protect the village from dissatisfied roving bands of outlaws and pillagers. We never fired a shot and the Fox was in the hen coupe. Now, Eastfield Village is a fine place as it has two taverns. One is a large two-story building run by Mr. Dunning. We quickly found that they don’t much like our kind there. They catered to Officers and finer folk. The other tavern was the Yellow Tavern, run by Mr.’s Duey, Cheetum and Howe. We didn’t exactly get a warm reception from them either but they knew we hadn’t been paid yet. Sjt. Krentler Distractes Mr. Dewey. Enjoying the fruits of an unattended bottle. Our first duty for the day was to set up the camp. Private Mutter was temporarily assigned to a young Officer of Engineers to help him with his baggage. Our first order of business was to cut poles for our tents. We went into the woods and quickly found the poles we needed. Taking care to make chopping noises at regular intervals so as not to arouse any suspicions of the Officers, we stayed in the woods as long as possible. When Mutter found us he had another rather large bottle of red wine. Instead of drinking this one, Sergeant Krentler entered into a deal with the Officer’s servant to sell him the wine and split the money with us. We didn’t want to tempt fate for too long, so we returned to camp to complete sewing ties on our blankets, to set up our blanket tents and to dig the fire pit. Private Torkos knows which end of a shovel is which so he dug the fire pit and it was his bad luck to be standing with the shovel in his hand when the young Officer of Engineers came by looking for someone to dig the latrines. John went along and helped dig the latrine and was lucky enough to witness the young Officer of Engineers fall into the latrine while testing the seat of ease. Unfortunately the latrine hadn’t been used yet. It was now time to go to pay call and to receive our rations. We collected our tin kettles and kettle bags and marched back into town. We received ten dollars in pay with the good Sergeant collecting stoppages owed to Captain Ishkibible. I believe Private Torkos only walked away with four dollars. We then proceeded to collect our food and rum ration. We received our beef, bread, butter, peas, and vinegar as a mess. Each man received a full gill of rum and noticing that the wench who was distributing the rum seemed a little befuddled, several of our men received a second ration. Back at camp we assigned Torkos to cook our ration while the rest of us went back to town for guard duty. Guard Duty was mostly uneventful. The suspicious Officer of Engineers conspired with his serving wench to catch the Sergeant receiving money for stolen property, which he did. The Sergeant however was slippery and managed to get off with a reprimand from the Town Major. No lashes and no reduction in rank. The Sergeant then proceeded to celebrate by stealing a cooked chicken from Mr. Duey’s table at the Yellow Tavern. Sjt Krentler makes his defense. After we were relieved from Guard we went back to our camp. John was just about done with the meal so we started to cool down. Lustenburger and I headed out to the local farmhouses and soon returned with some cool ale for the lads. Next we ate and finished our rum and started to change shirts and stocks for the chance for some fun at the taverns that night. It was time to spend our pay. As we approached the Yellow Tavern the most exciting thing that was going on was a game of checkers in the corner. Well that won’t do for the 22nd. We exploded into the place, immediately appropriated a table, moved the table to the center of the room, dragged half a dozen chairs over to the table, ordered a round of ale, complained about the price, complained about the pour, finished that round, ordered a bowl of punch, bossed the serving wench around and started singing. By the time we left I had sung every song I know that was appropriate to the setting including some we haven’t sung in years like "Johnny I Hardly Knew Ye" and "the Gentleman Soldier". Everyone in the room joined in on the fun and some even contributed their own songs. There were eggs to eat and tobacco to smoke. It became a standing room only Tavern and Mr. Duey actually opened his own parlor to accommodate the overflow. Somehow a fine small sword, which looked remarkably similar to Captain Najeckie’s, got traded for a bowl of punch. When the Captain reclaimed his sword Mr. Duey wanted the bowl returned and Private Mutter made sure it was empty. It was also noticed that many people of a higher station in life found there way from Mr. Dunning’s establishment down to see what was causing such merriment at the Yellow Tavern. Mr. Dunning himself actually made an appearance and shared our table and a bowl with us. All good things must end though, so we reluctantly left the Yellow Tavern when time was called. Lights still shone Mr. Dunnings Tavern so we staggered in the dark up to the light and gave them a song in the hopes of a bowl. At first Mr. Ackerman gave us a cold reception by slamming the door in our face but Mr. Dunning soon brought us a bowl and invited us in. Here we slowly wound down until it was time to leave this high society and return to camp and our beds. Passing the bowl in the Eastfield Yellow Tavern. The 22nd Regiment Yellow Tavern Redoubt. Sunday dawned fresh and clear. It was back to the Yellow Tavern for breakfast and coffee provided by the house. We attended church next. If the Sergeant sees you in the tavern on Saturday you best be in church on Sunday. After church we broke camp and packed our packs. There then was brigade drill in maneuver in open order and firing by platoons. We then cooled down with some cider at the Yellow Tavern and started to bid our friends farewell. There was a live shoot but we opted to leave early so we donned our packs, shouldered our muskets and took in our hands the extra blankets and axe and headed off down the road. Changed and cooled off at the cars and then drove home in clear weather and zero traffic. What a Great Weekend! 0600 and ready for action!